Clean, polish and protect any stainless steel surface in your home with our easy to use Stainz-R-Out Cleaner. Get rid of fingerprint marks on the fridge or other kitchen appliances. 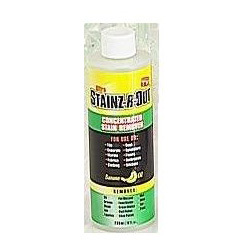 With your help we can reach more people and let them know about Stainz R Out whether this product works or not. I was impressed with this product in some cases and really unimpressed with it in others. Impressively, it took out ironed-in old cooking oil stains out of a cotton t shirt - oxy-action cleaners hadn't budged those stains and they'd been there for months. The product was able to remove old anti-perspirant build up from nylon, which I was also impressed by. Unimpressively though, it was unable to remove fresh blood out of a cotton sheet, even when I followed the manufacturer's instructions exactly and soaked overnight. It also did nothing for either new or old tea stains on cotton. Those blood and tea stains disappeared with an oxy action cleaner in the next wash. The stuff may be all natural and biodegradeable but it stinks to high heaven and smells like a solvent. It's also very expensive for what it is. I'd say that it's worth buying if you get a lot of oil and fat stains around the place but don't think that you can replace all of your old stain removers with it - you won't be able to. This is an Excellent product. My husband works as a handyman. This is the best ever stain remover I have ever used. I have thrown away all my other products, it is just too good.